Q: What courses do I have to take before I apply? Q: I did not complete all the required courses, can I still apply? Q: My GPA is lower than required, can I still apply? Q: Can I complete my graduate degree part-time? Q: Can I receive financial support and what are my chances? Q: What am I supposed to do if I am awarded graduate assistantship? Q: When is the deadline for application? Q: Do you accept application for spring semester? Q: What are the required components of an application? Q: To what address should I send my supplemental application materials and official transcript? Q: Is the general GRE test required to apply for graduate admission? Q: Is TOEFL required for international applicants? Q: Is a degree evaluation required for international applicants? Q: How long does it take to receive a decision? Q: Whom should I contact regarding my application status? Q: Where have your graduate students gone after graduation? 1. At least 48 credit hours of college science and mathematics courses are required. Yes, you can. In this case, you may be conditionally accepted if your academic records are excellent. Once accepted, you will be required to take extra courses to correct the deficiency before graduation. If you send your transcript (unofficial transcript is okay) to the Graduate Coordinator, Dr. Jamie Kim (kimj@buffalostate.edu), he will be able to tell you what courses you will have to take. Yes, we sometimes accept students with a GPA lower than 2.75. In this case, you may be conditionally accepted to pre-major and required to complete several required courses with B or better grade. Yes, you can. Some of our MS students complete their degrees part-time, but working on the degree part-time can double or triple the time required to complete it. Q: What are my chances of receiving financial support? Selected students (international and domestic) who are admitted are awarded financial assistance in the form of a graduate assistantship (GA). Selection is generally made based upon applicants’ GPA and courses taken. Once awarded, tuition and some fees are waived, basic health insurance is provided, and a monthly stipend is paid. Since limited seats are available every year, early application is strongly recommended. You are required to work about 20 hours per week. It includes teaching two classes of 100-level lab classes (e.g., general chemistry), working in the stockroom, preparing for labs, and attending the chemistry help desk for undergraduate students. July 15th for domestic students and May 15th for international students for admission in the fall semester. If you are considering financial aid, an early application is strongly recommended due to the limited availability. An online application form. Do not submit a paper application. No, we don’t require the general GRE test. Yes, applicants with a minimum TOEFL score of 550 or higher on the paper exam or 79 on the Internet exam, or with an IELTS score of 6.0 or higher, may be considered for admission. 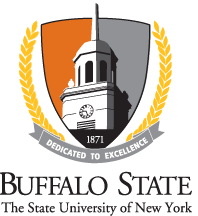 To request your official TOEFL score to be sent to Buffalo State, please use our code 2533 when completing the TOEFL registration materials. A degree evaluation is required for all students who have completed a bachelor's degree outside the United States. For details, see the link here. There is no standard time for processing an application and receiving a decision. However, it is generally 2-4 weeks between the time a complete application is received and the time a decision is made. Please contact the Graduate Program Coordinator, Dr. Jamie Kim at kimj@buffalostate.edu with any questions regarding your status. Q: Where have your graduate students gone to work after graduation? They are currently working at federal/state agencies, research/industrial laboratories. Some students are attending the graduate school for doctoral degree or professional school (pharmacy).